One of the most beautiful, and important, parts of the wedding ceremony is the exchanging of vows. The air is charged with excitement and all eyes are upon us as we recite those words which have meant so much to generation after generation. Many people opt to personalize their wedding vows, but you can take this to a whole new level by writing a poem for each other expressing your love and true feelings. 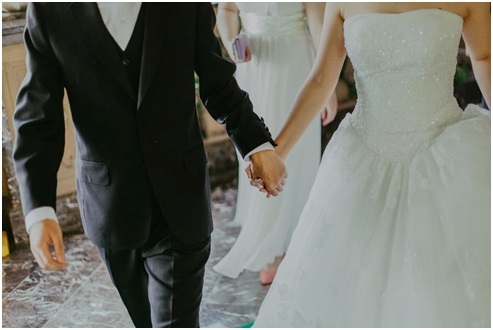 The reading of these poems will make a perfect start to the formal wedding reception; don’t worry if you don’t think of yourself as a poet, take a look online for examples from great love poets like Keats or Wordsworth, or simply write from your heart. There won’t be a dry eye in the building. The wedding ceremony is supremely moving, but it can also be stressful, so it’s always a joy to finally be married and celebrate at your reception. The wedding reception allows you to share the joyous event with those who mean the most to you, so it’s a convivial atmosphere of love. It’s also a great place to add a real touch of elegance by using high quality table settings and crockery. POSH Couture Rentals are the specialists in the rental of beautiful items that can elevate any wedding from the good to the spectacular. They have a large catalogue to select from, and while they have items to suit any budget, they are all pleasing on the eye. Your wedding ring is the ultimate physical embodiment of your marriage: strong, stable and enduring. That doesn’t mean that it has to be dull however, and all too many wedding bands are simply unadorned rings made of gold or platinum. A bespoke wedding ring shows that you’ve put as much thought into this item as you have into the rest of your wedding, and as it will be constantly on display for the rest of your life, it can make a big impression. Custom made wedding rings can be engraved with patterns or symbols that mean a lot to both parties, with names, or with professions of love. Unique wedding rings and an exchange of self-penned poems help to put you and your loved one right at the very heart of your wedding ceremony, which is just where you should be. Ornate table settings of the highest quality also add a touch of class, and they help to ensure that the wedding party and all the guests have a day they will always cherish.